Sometimes, you don't want to be battered by intensely difficult music, but by the flying limbs and whipping hair of everyone around you. Sometimes you want to have a filthy, sweat-soaked, orgiastic good time in the pit, scream-singing your lungs out to some find, bathtub-gin subtle American groove metal. And for that, Lamb of God are, and were, completely perfect. 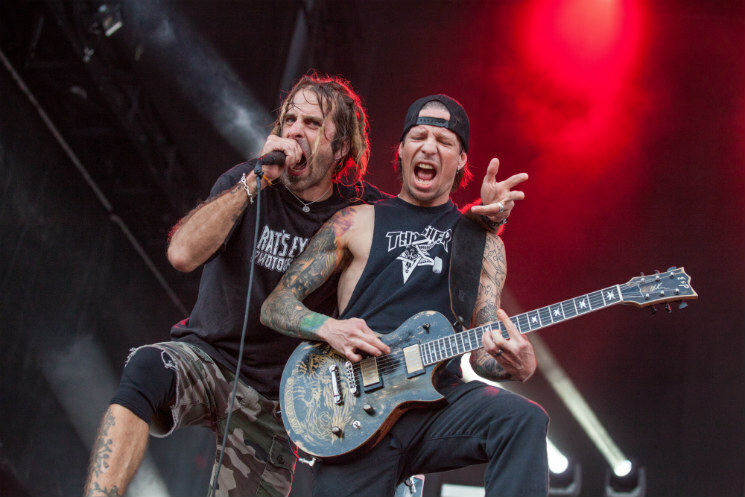 There was a steady stream of kids flying over the barriers throughout their set, while vocalist Randy Blythe ran around the stage like a demented circus ringleader in camo cargo shorts, encouraging the vast pit (which was almost as wide as the massive field in front of the stage) to even greater size and ferocity. The entire set was a vast sing-along, a unified and thunderous voice calling back every lyric to "Walk With Me In Hell" and "Set To Fail." One security guard kept a fire hose on the whole time, creating heavy artificial rain and reducing the field to a churning mud pit. By the time the set ended with a triumphant rendition of "Black Label," the entire crowd was soaked, delighted, filthy and wonderfully exhausted.